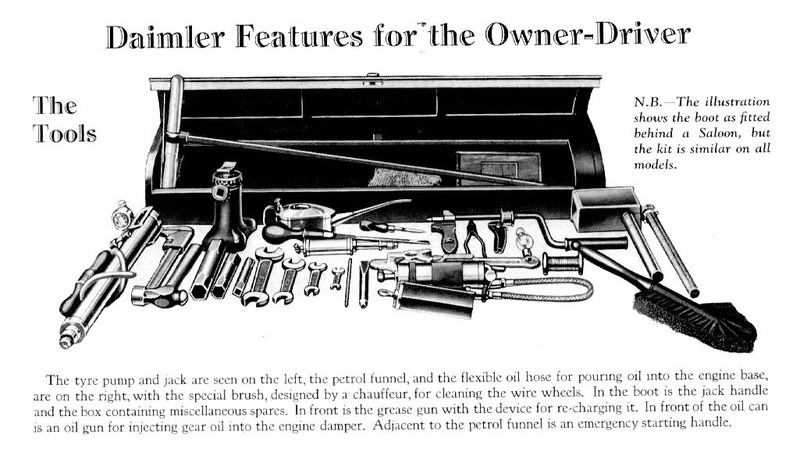 The tool kit supplied with a Daimler was pretty comprehensive. Today you often find cars supplied with just an aerosol of tyre sealant, but a chauffeur in the 1920s would be expected to perform many repairs at the roadside. Our car had retained many of the tools originally supplied, some of which are now unobtainable. Others are readily available, having remained in production for many years. Some are still in production. Four spanners were shipped in the toolkit. However, the BSA range was used by many manufacturers, and eBay has allowed me to extend the range from No.1 up to No.13. The tools are well designed and well made. Proper steel, with no tendency for the jaws to spread and slip off. Two adjustable spanners and a pair of Footprint pipe grips catered for those times when a spanner was not quite right. These pipe grips are the smallest I could get, but are still larger than the originals. This design of oil can was probably made by the specialists in Leeds for over half a century. It matches the illustration in the parts manual exactly. The original tyre pump had lost its pressure gauge and tube. With a fresh tube from another pump, it will inflate tyres, but an electric compressor is much easier! . The makers, Ernest Hill of Sheffield, are still in business making industrial pumps. A cold chisel was part of the original toolkit. Presumably things had to be in quite a state for it to come into play, say cutting away parts of another car which had crashed into yours. This new one has the same shape as those of a century ago.